Cast: Reese Witherspoon, Mark Ruffalo, Jon Heder. Story: A woman haunts her old apartment and only the new tenant can see and hear her. Just Like Heaven isn't particularly heavenly, but I suppose they couldn't really call it Just Like Twenty Other Equally Forgettable Movies, could they? Reese Witherspoon plays a workaholic doctor - but don't worry, when she turns into a ghost she has plenty of opportunities to show off her well-formed whiny bimboid style. Mark Ruffalo (In The Cut, Collateral) moves into her old apartment after her coma-inducing accident but Reese's ethereal form seems reluctant to let the apartment go, leading her to drift in and out, through walls and so on, yadda yadda. We've all been there before, and there's nothing novel enough or gripping enough to give Just Like Heaven an advantage over its contemporaries. 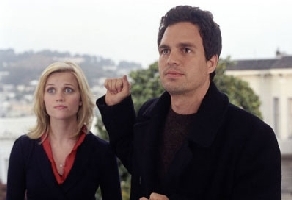 The biggest issue is with Ruffalo's cardboard cut-out of an emotionally damaged singleton, which stifles any chemistry that may have appeared between him and Witherspoon. The second problem is with the dozy-arse plot - but I guess I shouldn't be surprised by that. The best scenes are provided by Napoleon Dynamite himself Jon Heder, as a hippy-like psychic, but they're few and far between. The rest of the proceedings are pretty half-hearted, with plenty of attempts at humour, but none of them are full-blooded enough to actually raise a laugh. The script is tired with many lines blatantly ripped off from other movies and TV shows and there's no mention of the copious opportunities for mischief that would arise from a friend that only you can see (anyone for poker?). The whole movie has a sense of a lack of motivation, a way to turn a small profit and nothing more. In its own way it's quite entertaining, but can't even begin to compete with any of the major pictures. Just Like Heaven is an unremarkable and shallow chick-flick with very little of the chemistry that is so critical to this kind of movie. It's not horrible, it's just desperately average in every way. Testosterone Satisfaction Rating: 0/5 - chick-flick! To enjoy this film you should be: female. And uncritical. Just Like Heaven is on general release in the UK now.